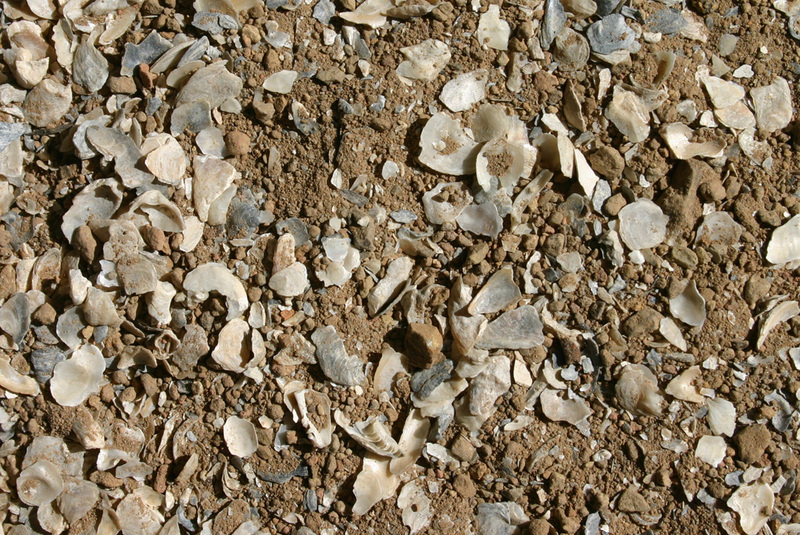 Ground oyster shells are a perfect material to help ensure proper drainage of your bocce ball court. Bocce Blend is specially formulated for use in bocce ball courts. Available in bulk only. 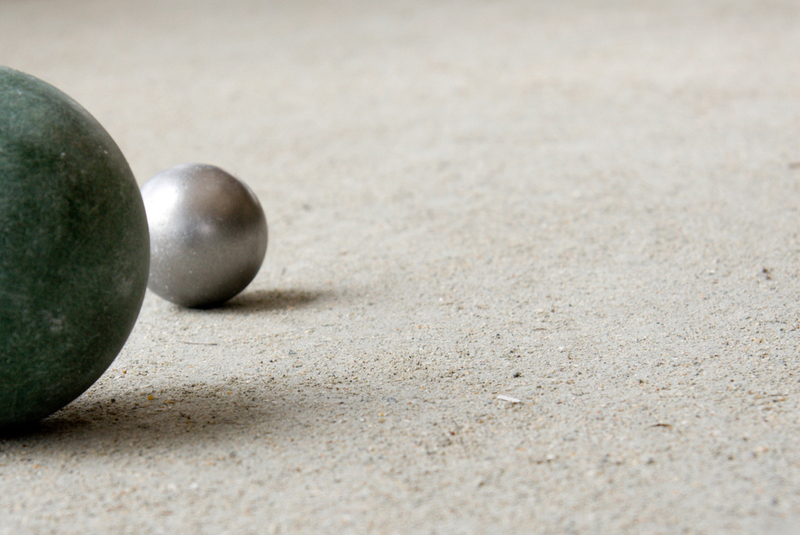 How to build the perfect bocce ball court using Lind Marine’s ground oyster shells. 12 TONS CRUSHED STONE (#1 or #2), GRAVEL MIX or OTHER COMBINATION OF PEBBLES, or GROUND OYSTER SHELL, WHICH WOULD PROVIDE GOOD DRAINAGE. The site you select for your bocce court should be the most level area you have available. This is imperative since the final court surface must be as close to level as possible to provide the most satisfactory playing conditions. Also, it is recommended that the length of the court run in a north/south direction, if possible, to prevent uncomfortable sun glare at sunset. NOTE: Court dimensions vary widely depending on the rules played and the space available. 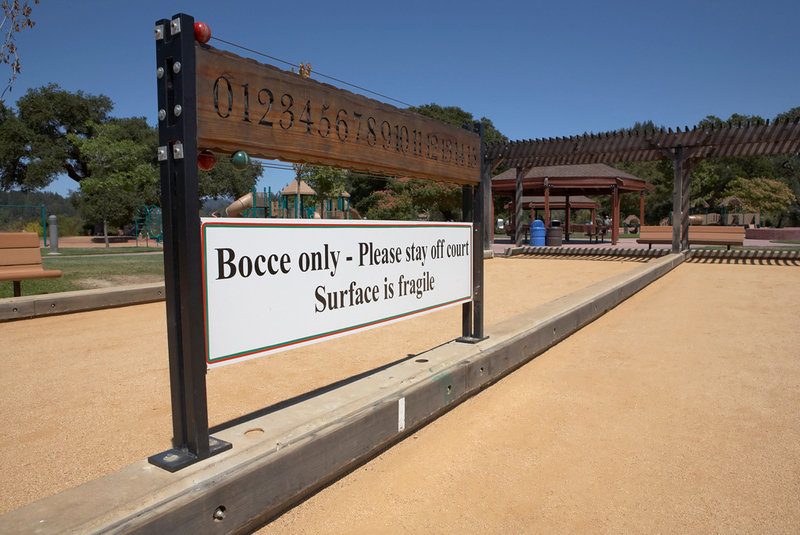 The international Bocce Association dimensions are 12′ wide by 60′ long. If you want to build a court for recreational use for yourself, your family and friends, the size should be whatever fits in your back yard and makes you happy. If the site selection is not flat and level, and cannot be corrected easily with the application of gravel or crushed stone, it is suggested that grading with a bulldozer, or other equipment be undertaken. If the site has minor variations in elevation, it is recommended that an area slightly larger than the finished playing area be stripped of sod (16′ x 64′). It is suggested that the stripped area be treated with a commercial herbicide to prevent new growth of grass and weeds through the court surface. At this point, approximately 10 tons of #1 or #2 crushed stone should be spread evenly over the stripped area. The crushed stone will provide a relatively level area and will also provide drainage for the court. The actual playing area (12′ X 60′) can now be laid out using four stakes and mason’s twine. The collier stakes for the side boards are placed at a distance 60 feet apart; and the end boards are placed 12 feet apart. 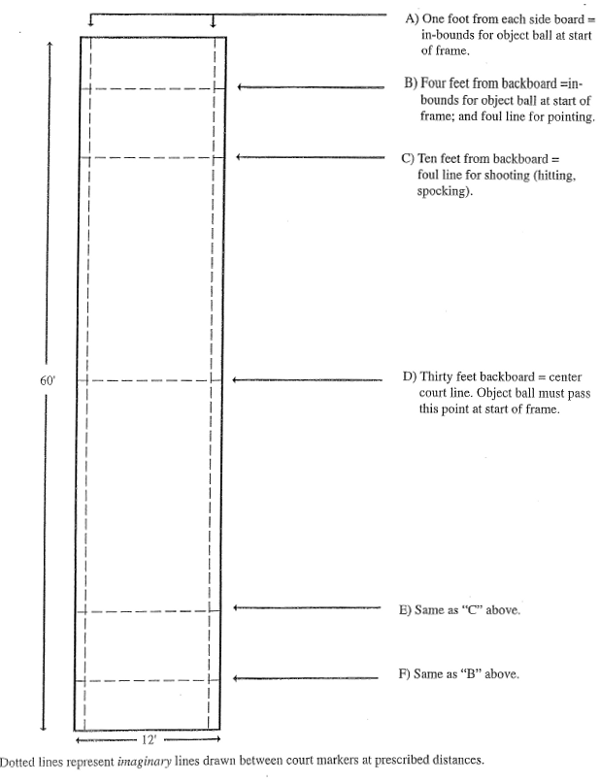 To “square” the court, the diagonal distance between colder stakes should measure 61′ 1/4″ for a 12′ X 60′ court. When the collier stakes are properly located, they should be driven into the ground sufficiently to prevent movement. At this point, a transit should be used to mark the four stakes. If you are using 10″ sideboards, mark each stake 10″ from the crushed stone and shoot your transit readings from that mark. Note: If you are not using a transit, refer to step 3x. When the corner stakes are marked, stretch the mason’s twine around the four stakes, securing it tightly to each of the stakes at the level of the mark. If a transit is not used in the court installation, follow the same procedure as above to set the stakes and run the mason’s twine. Rather than marking the stakes, begin setting the sideboards only one side of the court, using the stretched mason’s twine to keep them in line and leveling each board with a carpenter’s level as you go along. DO NOT SET THE END BOARDS YET. After one side has been set, begin setting the opposite side along the mason’s twine. Level this second side relative to the first side. This can be accomplished by using a long (2″ x 6″ x 14′) straight board to span the two sidewalls and placing a level on top of the board. Steel reinforcing rods 5/8″ x 24″ can be used to anchor sidewalls that are thicker than 3″. Holes are drilled vertically down through the width of the sideboards at intervals of 5′ to 6′. 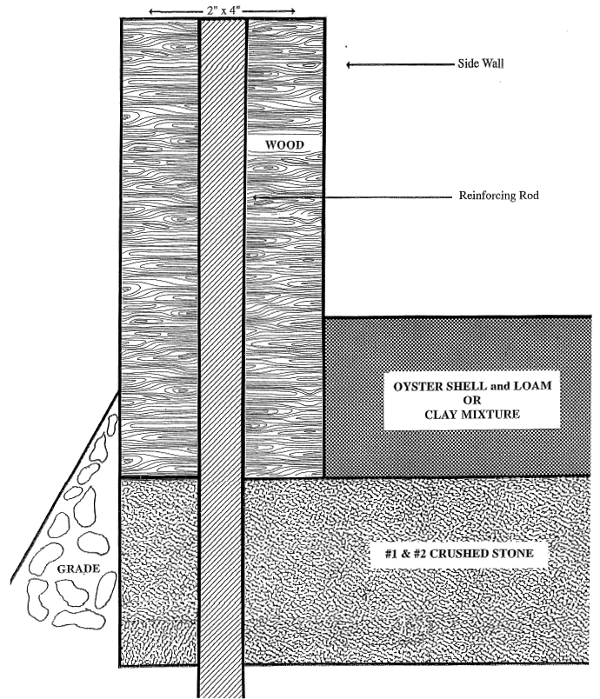 The rods can then be driven through the boards until they are flush with the top of the boards (see cross sectional diagram). If 2″ or narrower sideboards are used, 1″ x 1″ x 24″ angle iron is suggested. These are spaced at intervals of 5′ to 6′ and are driven into the ground next to the sideboards and attached to the sideboards with screws. In either case, the internal and external finished grades of the court will further help keep the boards in position. When the court is ready, dump the Bocce Blend at several locations of the court and spread it out evenly. Use enough material to give a uniform depth of 3″ to 4″. The mixture is then leveled with the use of a screed or other leveling tool. The surface must then be compacted. A plate tamper or a heavy lawn roller (300# to 500#) should be used. You may need to add more Bocce Blend to maintain the 4″ thickness. The surface should also be sprayed with a garden hose to get additional compaction. Another method of compaction is to flood the court. Then while still wet, a bull float (cement finishing tool) can be used to smooth out the surface.When the court has dried out completely cracks may appear on the surface. the backside of a rake can be used to move the surface around to fill in the cracks. A garden roller will do the same plus compact the surface further. Finally the court is dusted with oyster shell flour to make the wear surface. It is rolled flat. At this time it should be dry enough for a cloth to pick up the surface. The court is misted, dried, and more flour is added if needed, and rolled again until you get a solid and smooth surface. Too thick of a layer of shell flour may crumble and form a powdery surface. Save left over flour for future court maintenance. At this point, the dimension of the end boards can be determined by measuring the distance from the top of the surface and the top of the sideboards. The end boards can then be fastened to the sideboards by nailing or screwing. No reinforcement rods should be used on the end boards. Since the end boards receive constant pounding, it may become necessary to replace them occasionally. After the end boards are in place, the court surface should be screeded again, then dampened and rolled. The court is now ready for use. Although it may appear “spongy” at first, use and maintenance will ensure compaction. In-bounds markers and foul lines should be applied to the side walls and end boards of the court (see court diagram markings). The markings are traditionally painted or taped on the wall boards and do not require any markings directly on the court surface. Your bocce ball court can provide years of enjoyment, requiring minimal maintenance and virtually no additional expense. Normal maintenance requires that the court be “groomed” after use. This is accomplished by brooming the court after play. The type of broom suggested is a long, coarse bristle push broom, 24″ wide. Usually two of these push brooms are attached end to end, forming a 48″ wide broom that is dragged across the court in each direction thereby grooming the court surface. Occasional maintenance requires brooming, wetting, then rolling the court. Additional oyster shell flour might be added at this time. This is suggested about once a month for home courts and about once a week for commercial courts. Spring maintenance requires that the surface of the court be loosened by scraping the surface with a rake, then brooming, wetting and rolling the court. The 4″ x 4″ x 11’6″ angle iron may be used to reestablish a flat surface whenever necessary. The side boards may require a realignment occasionally – follow step 3x.